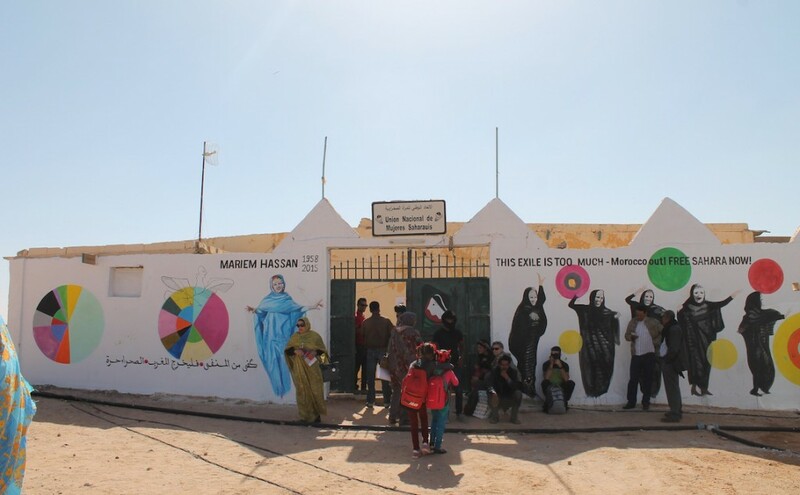 „Mariem Hassan 1958-2015“ is a mural, placed on the outside wall of the Union National de Mujeres Saharauis(the national women’s association of Western Sahara), which was planned and executed by myself, Bettina Semmer in November 2015 in Boujdour/refugee camps during the 9th edition of ARTifariti. Divided in two by the entrance, the wall has a portrait of MH singing to the left of the gate, and five figures that portray her dancing during a concert on the right. This division marks a duality of beauty: the beauty of outer shape and colour (the singer in a blue melfa, with pretty face and traditional head jewelry), and the beauty of movement or action, as seen in the dancing multitude of figures in black, on the right. One could also project a duality of Apollinian and Dionysian attitude into the two sides of the mural: wild dance, with hardly discernable features, on the right, and calm composed expression with Mother-Mary-like body language on the left. This is not some kind of personality cult, nor the simple portraiture of MH, even though she is probably one of the finest examples in world music of a combination of tradition, political resistance and a unique voice, deserving far wider recognition than she already has. To paint her in the year when her life ended – prematurely caused by a terminal illness, that finally prompted her to return to her people in the refugee camps – would be reason enough. 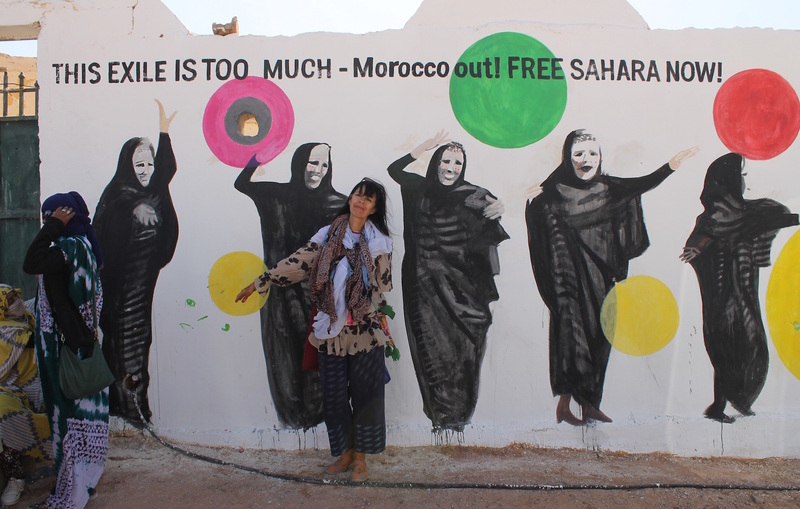 But there is more to it: I used the figurative representation of MH, together with words (This exile is too much – Morocco out – freee Sahara now!) and concrete shapes (the two big, intersectioned circles on the left as well as many smaller spheres on the right) to make up a postmodern, readable narrative in many facets. The stylistic eclecticism gives room for imagination, for making connections and for free play of creative readingwhich is one of the most rewarding things in art/life. 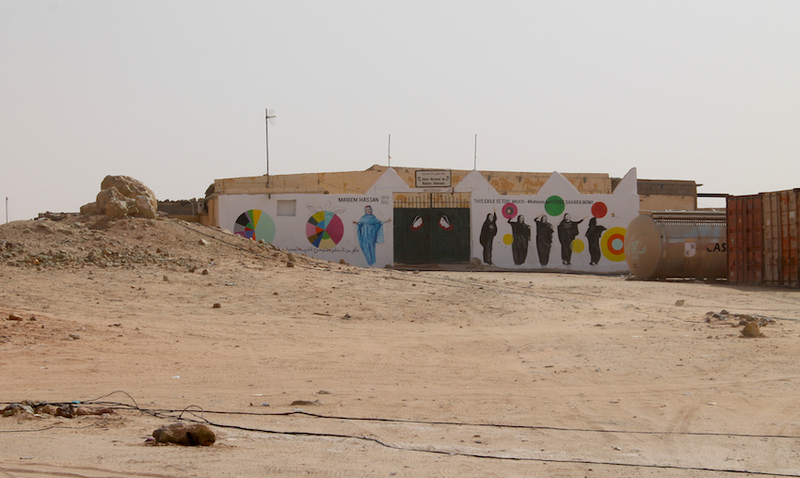 Last but not least, the mural serves as a huge opportunity to have one’s portrait taken there, should one agree with the words, thereby sending out a message to the world. Colour has always been a great attractor, associated with experiences out of the normal everyday life (church windows, medieval art and it’s rare and costly pigments), with exultation, joy and lust for life. Specific colours have been said to have powers over the mind-body-unit, as in colour psychoogy and therapy. The intersections of the larger circles on the left are inspired by Barbara Steppe, who in turn takes her inspiration from Otto Neurath, the inventor of graphics for statistics. They can be read as depictions of states of mind, of a country’s socio-economic order (or disorder), as arbitrary as the world’s division of riches, or merely as formal play. They are based on Mandalas with their power to focus the mind. 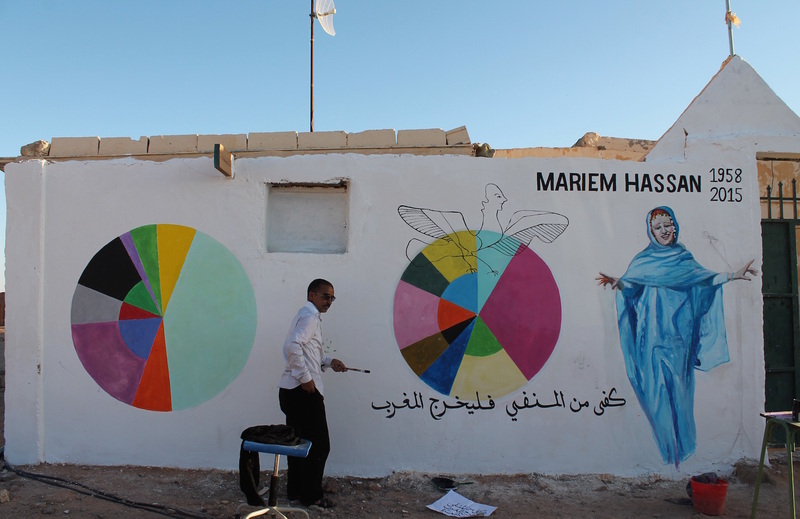 The priority was to make something understandable, readable, a common narrative combined with decorative elements, and also a tribute to the strength and beauty of Saharaui women. It would not occur to me to alienate the ladies who run the place, (Fatma, Hassina) so a meeting over the drafts preceeded the actual painting process. Occasionally, children from the nearby school and neighbourhood would assist, even in my absence adorning the wall with handprints and marking the faces with pink dots, making this piece complete. This fits in with my general approach of taking participation seriously, and incorporating into my work what I find in a place, and in its people. I hope to contribute to a free Sahara where people can live in dignity, without being oppressed by a hostile regime, and where the Saharaui’s talent for a good life, as we as particpants know it, can blossom in a peaceful surrounding, in independance.